Choose this Gorgeous Swarnachari Saree Online from, Online Naksha at reasonable rate for your upcoming occasion. Pallu and the border of the saree is intricately woven with golden zari and the maroon mina highlights the weaving pattern. 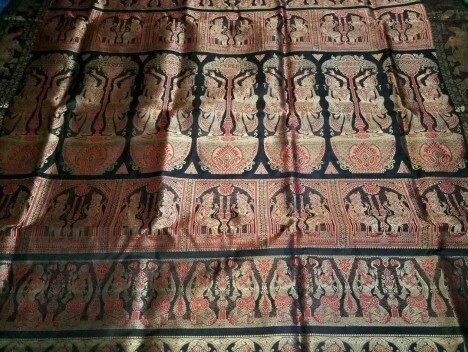 Richly weaved pallu of the saree depicts the tale of Mughal Raj. This black saree with golden zari and maroon mina works has made it a piece of charm at a glance. Most importantly the red black combination looks very pretty. 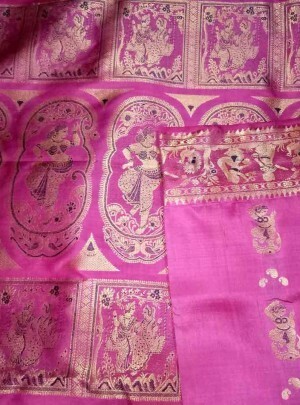 As well as wedding party these sarees are are nice to drape in occasional parties. Also, This saree comes with a running blouse piece. Is this saree good for wedding at night.and also do you have different pattern of border but colour combination should be same. Yes mam we have and it would be a good choice for a wedding night. Pls get in touch 7551004229.